Today's post is by Kristian Tvedten, editorial assistant at University of Minnesota Press and a coordinator of the Minnesota Archive Editions program (announced in November 2008). 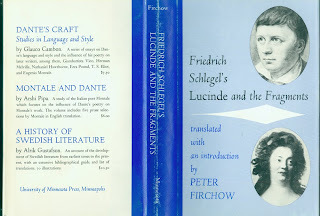 Friedrich Schlegel's Lucinde and the Fragments, translated and with an introduction by Peter Firchow. * Firchow's translations of Schlegel's work continue to find use in courses on German Romanticism and literary criticism. Lucinde and the Fragments (1971) was Firchow's first book with the Press. A professor of English at the University of Minnesota, Firchow authored a number of titles, including three others published by Minnesota: Aldous Huxley: Satirist and Novelist (1972), The Writer's Place: Interviews on the Literary Situation in Contemporary Britain (1974), and a translation of Schlegel's Philosophical Fragments (1991). Firchow's engagement of Schlegel anticipates the kinds of philosophical and theory-based works of literary criticism that Minnesota would become known for during the 1980s. Spain and Portugal in the New World, 1492-1700 by Lyle N. McAlister. * Monumental in scope and a popular course text, Spain and Portugal in the New World, 1492-1700 is an indispensable reference and a meticulously researched introduction to colonial enterprises in the Americas. Lyle N. McAlister was a professor of history at the University of Florida for 35 years. This is the third installment in the 10-volume series "Europe and the World in the Age of Expansion" -- an ambitious exploration of global colonial endeavor that began at Minnesota in 1964. This series was the brainchild of Herbert Heaton, a distinguished economic historian and author of The British Way to Recovery (Minnesota 1934). Sponsored by the Department of History and the James Ford Bell Library of the U of M, 10 projects were approved by an advisory board of six members. Books in the series are essential for any reader interested in colonial history, imperial expansion, and global political development. Check back soon for more information on Minnesota Archive Editions. * Titles in the MAE program utilize a template paperback cover. Covers shown here will not appear on recently ordered books.